A Top Fun in GTA Vice City. 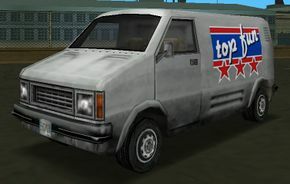 The Top Fun van is a vehicle in Grand Theft Auto: Vice City that contains controls for RC (remote controlled) cars, helicopters, and planes. The Top Fun van is almost identical to the Pony, but has flat sides. Once entered, it automatically starts a mission involving RC vehicles. The various RC vehicles are used for missions which involve races or carrying explosives to targets. The van is invariably painted white, and also emits a different engine noise from the Pony, sounding more alike those of the Greenwood and Regina. On the beach in Vice Point. Starts RC Bandit Race. Top level of the car park at North Point Mall, Vice Point. Starts RC Baron Race. Freight and Cargo Terminal, Escobar International Airport. Starts RC Raider Pickup. An alternative Top Fun logo found in the game manual, more resembling that of the film Top Gun. The name of the van is evidently a pun of "Top Gun", a 1986 film. This page was last modified on 20 July 2012, at 22:57.